Two years ago we arrived to charming George Town with the intention of staying one week. We stayed one month in the end. In May 2015 we returned and again we stayed much longer than we had planned, and we will be definitely coming back to this intriguing town in the future. Where exactly can you find this town of wonders? 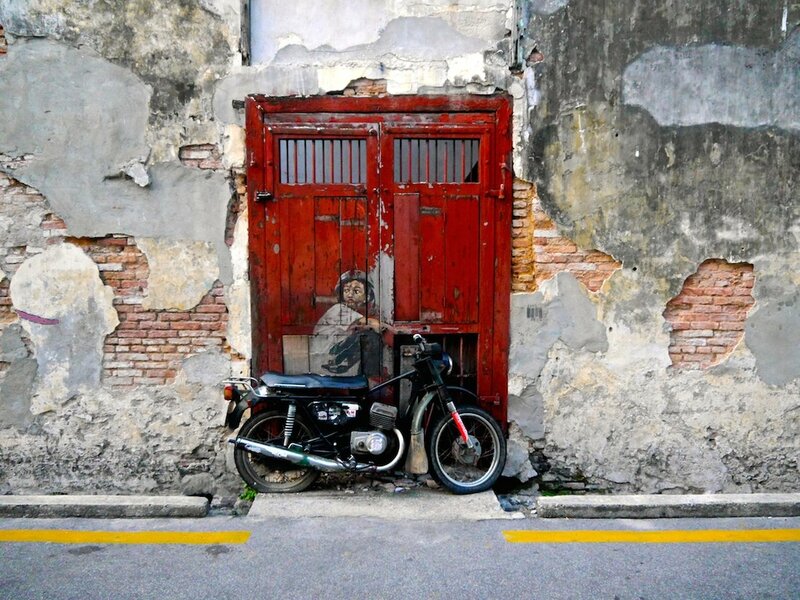 George Town is situated on Penang island in the north-west of Peninsular Malaysia. We always feel home in George Town thanks to its kind, friendly and cheerful people. As vegetarians, we also enjoy the wide variety of lovely vegetarian food. And there are so many wonderful and interesting places to admire! The picturesque busy town with its alluring smell of food and incense sticks everywhere you go doesn’t let you leave. 1. George Town is a fantastic mix of Chinese, Indian and Malay people, their cultures, architecture, religions and food. 2. 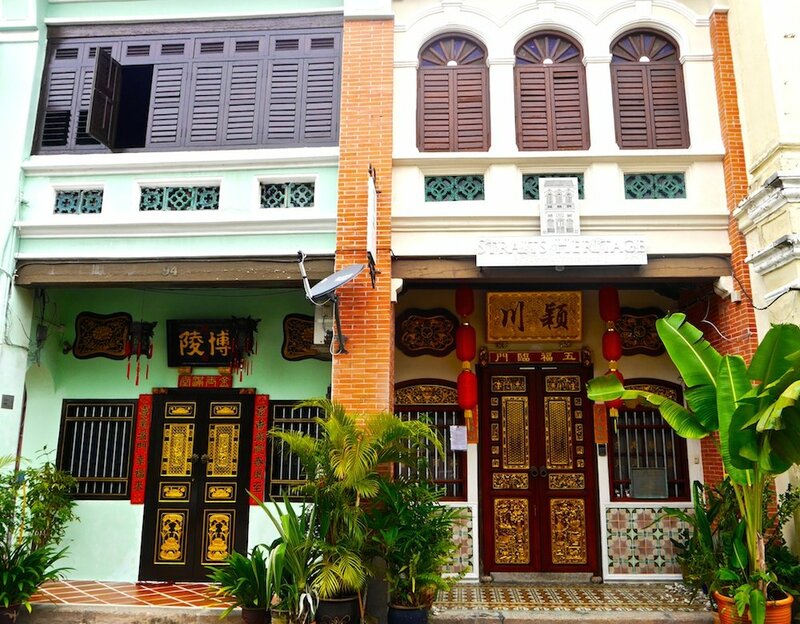 George Town is an architectural gem in South East Asia. The bustling colourful town named after the British King George III is renowned for its beautiful colonial architecture listed as a World Heritage Site by UNESCO. 3. 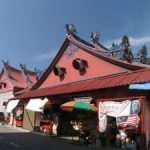 George Town boasts many absolutely amazing and unique Chinese temples which you won’t find elsewhere in South East Asia. 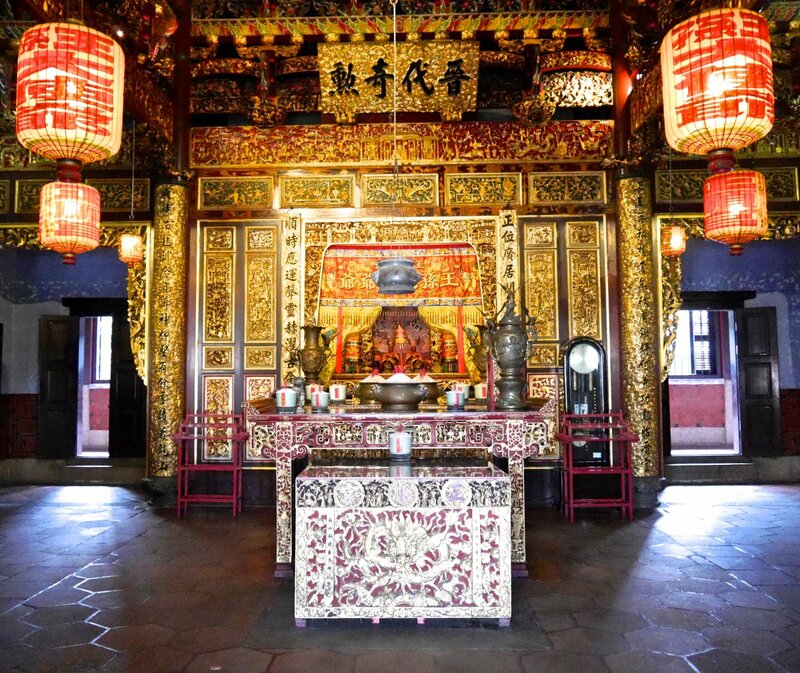 Our favourite temple is Khoo Kongsi temple that is the most beautifully carved of all Chinese temples in town. It’s the biggest clan house in Malaysia. It was built by the Khoo clansmen more than 100 years ago and its lineage can be traced back 650 years. The section on the ground floor displays information about the clan and about waves of Chinese migration to the rest of Asia. Khoo Kongsi is really exceptional and the day we visited this temple we were lucky enough to be there alone and feel the place. 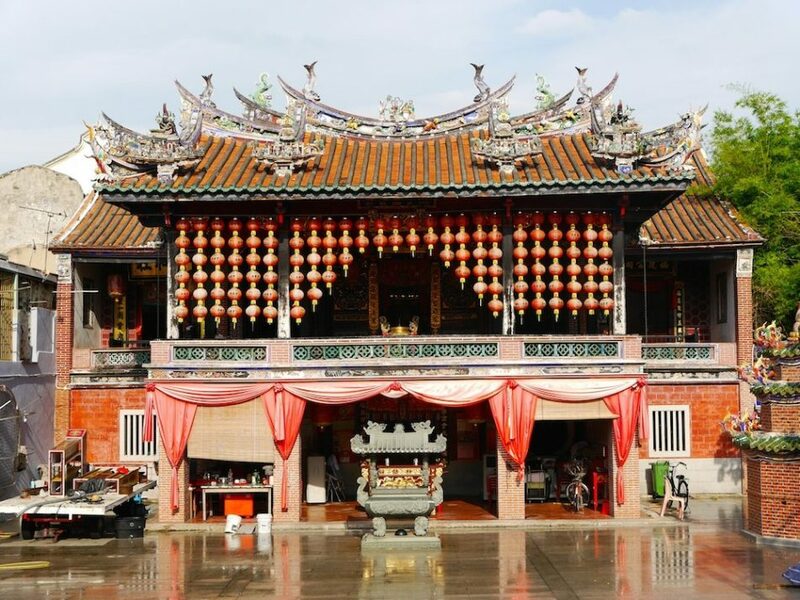 The second most beautiful temple is Hock Teik Cheng Sin temple, a two-story community temple devoted to the worship of the God of Prosperity and Morality that was built in 1850. There are many more temples in the town, you can spot them while strolling around. The best and most comfortable way to visit not only temples is to jump in one of the funny rickshaws with very friendly drivers. They are always happy to take you around, equipped with a map and some English words. 4. Immerse yourself in Indian life in Malaysia. 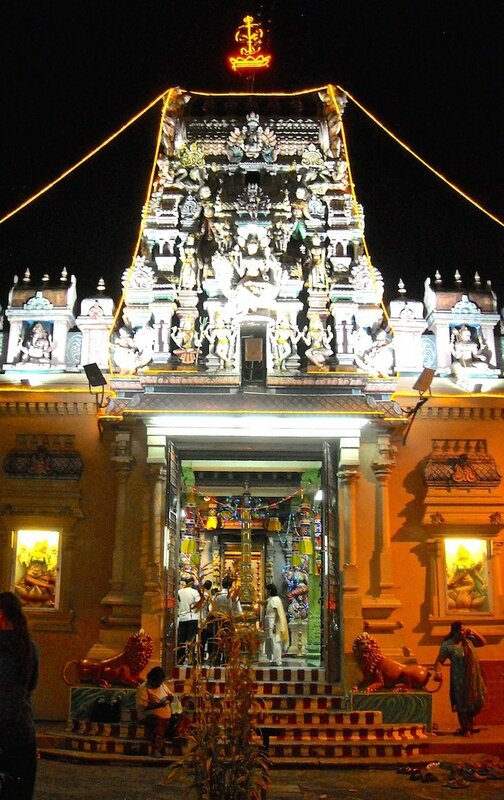 Little India, an Indian quarter of George Town, is a lively part of the town and a real joy for senses. Colours, flowers, golden jewellery, Indian clothes, loud Bollywood music, the alluring smell of incense sticks and Indian food – one feels like being in India! 5. George Town is a food heaven for everybody. 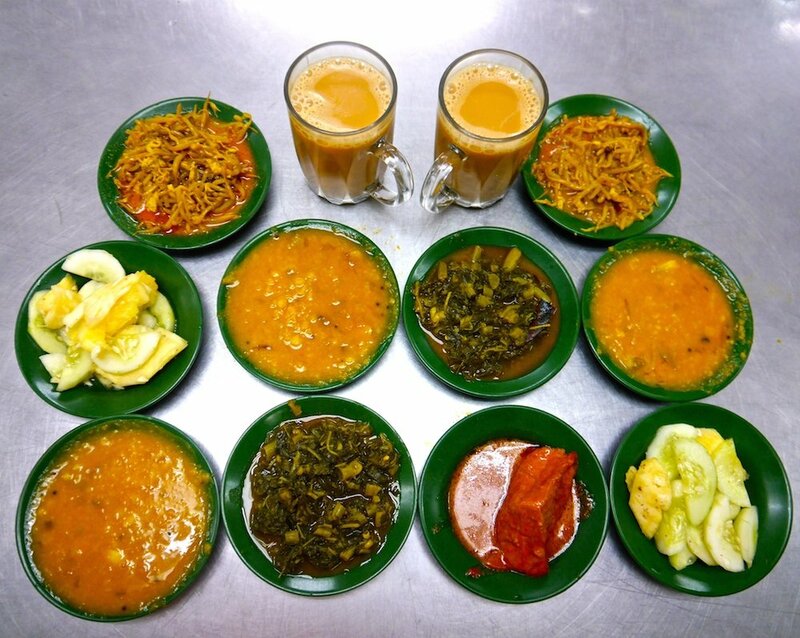 The delicious Indian, Malay and Chinese food can satisfy every gourmet. 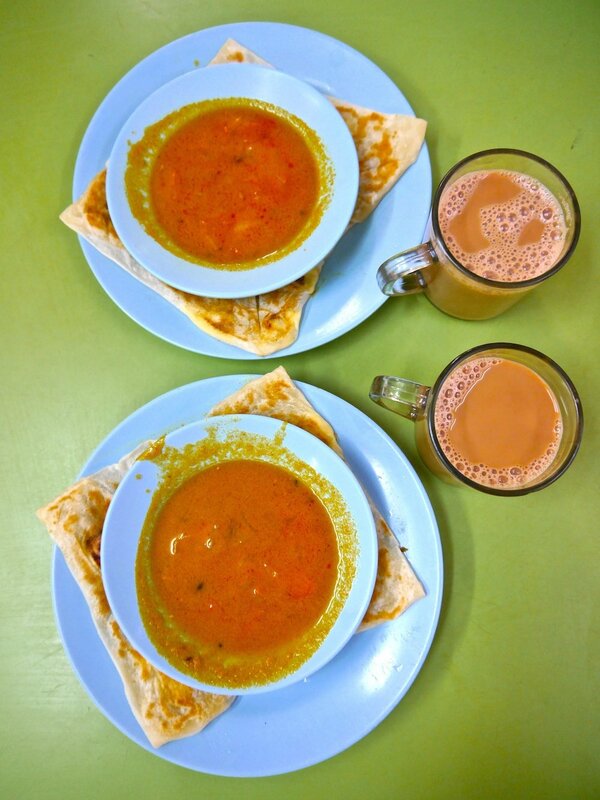 Little India is a perfect spot for eating out. Our favourite restaurant is called Tajuddin Hussain and it’s just opposite the Sri Mariamman Hindu Temple in Queens Street. They serve both vegetarian meals and meat. And if you go out of the restaurant and turn right, you can see a small stall with fantastic potato samosas and sweet desserts. It’s definitely worth stopping by. Good Indian vegetarian restaurants are in Penang street, where you can also find a popular non vegetarian Sri Ananda Bahwan restaurant. 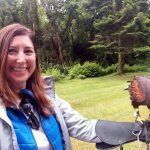 Look for your own place to eat, there are plenty of them! 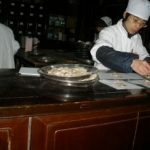 Try Chinese food at busy Chinese stalls in Chulia Road in the evenings, have fresh fruit or vegetable juice or coconut, or just watch the fascinating chaos. It takes only 5 minutes to walk from India to China in George Town! 6. Experience Indian religious life right in the middle of George Town. The colourful Sri Mariamman Hindu Temple in Queen Street in Little India was built in 1833 and it is the oldest Hindu temple in Penang. 7. 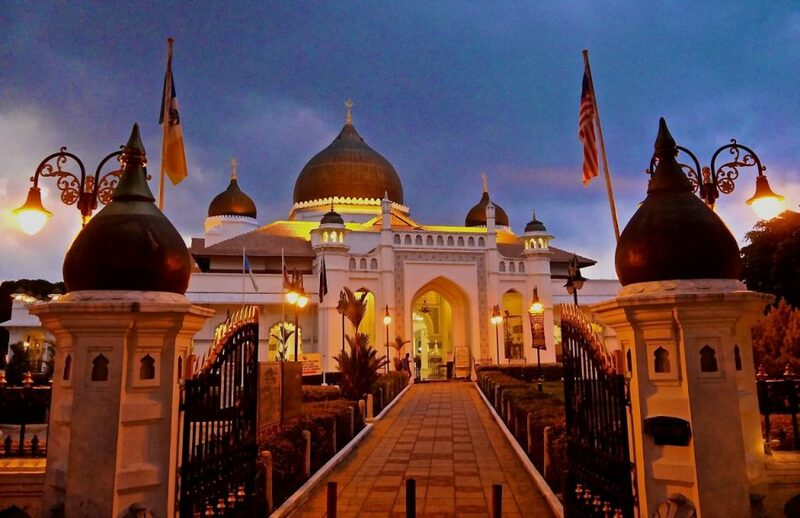 Meet the religion of Islam and visit beautiful mosques of George Town. We liked Kapitan Keling Mosque the most. It’s situated in the street with the same name. This charming mosque was built at the beginning of the 19th century. Visitors are welcomed, but not allowed to enter during prayers. Dress modestly. 8. Uniquely funny street art of George Town makes the town even more interesting and impossible to forget. We love the works created by Lithuanian artist Ernest Zacharevic. Get a map of the places in a stall in Armenia street. Rent a bicycle or take a rickshaw to explore them all. You can also find 52 iron structures around the town, they present anecdotes about the history of the streets. Get a map called Marking George Town at the airport or in your hotel before heading to the streets of George Town. 101 lost kittens is a work of Thai artist Natthapon Muangkliang and Malaysian artists Louise Low and Tang Yeok Khang aimed at creating awareness of street animals. All of these 101 kittens are depicted in 12 artworks that are spread around the heart of George Town. 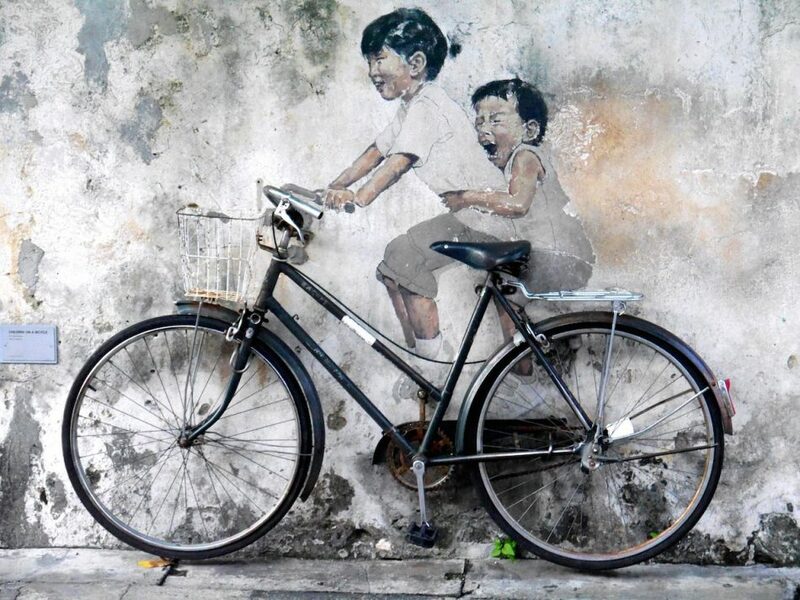 There are many different street artworks besides these in the streets of George Town. 9. 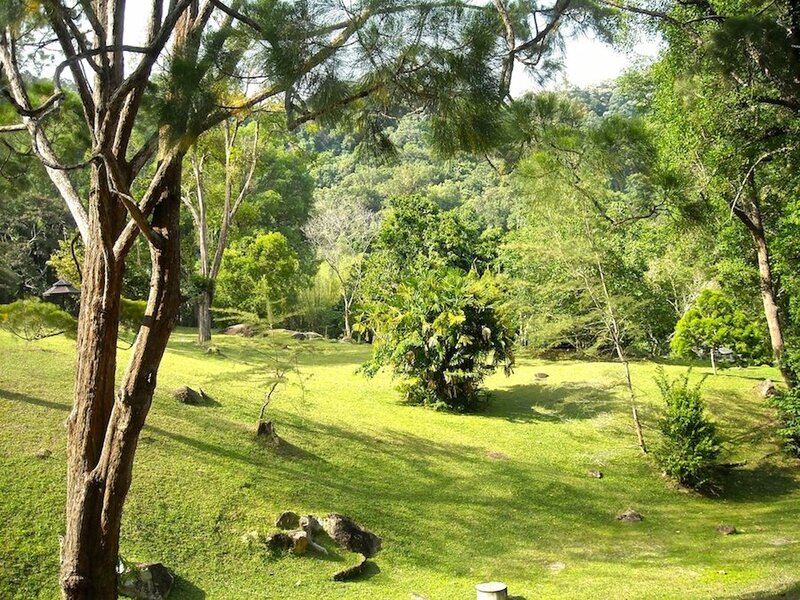 Green botanical gardens are only a stone’s throw away from the centre of George Town. Set up by the British in 1884, botanical gardens contain a huge variety of indigenous and exotic plant species. They are also known as Waterfall Gardens, because of the 122-metre high cascade at the end of the Botanic Gardens. Apart from many plants, you’ll see lots of monkeys in the botanical gardens too. Take a bus 7 from the centre George Town. 10. From the town straight into a jungle? Yes! Penang National Park (Taman Negara) is just a 45-minutes bus journey from the centre of George Town. 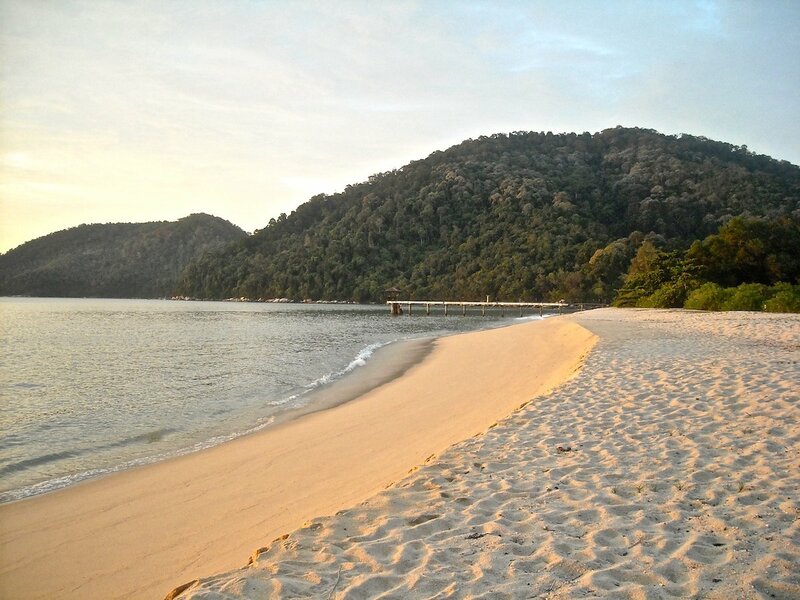 Located in the north west of Penang island, the national park is an amazing jungle by the sea and a great gateway from the heat and the busy town. It covers an area of about 2000 km and has more than 500 flora and fauna species. Take a bus 101 and get off at the last stop. Then walk to the gate of the park where you have to register (bring your passport with you). The narrow road will lead to a small signpost in the jungle, take a path to the left. In about one hour you will come to Turtle beach (Pantai Kerachut). If you turn left, you’ll go to Monkey beach, but this jungle trek is not as nice as the trek to Turtle beach. After an hour trek through a beautiful jungle you’ll find yourself by Turtle beach and a meromictic lake. It’s a lake with two layers of water (lake fresh water and sea salt water) that don’t mix. We don’t recommend swimming in the sea, there might be stingers. Visit the turtle sanctuary at the end of the beach. It’s possible to camp at a camp site that is close to the sanctuary . There’s a rental service opposite the entrance to the park and they have big tents for a few people for 30 ringgits per night for rent. Because of monkeys, we don’t recommend sleeping in a hammock. Buy food and water in a village. We were camping at the camp site by Turtle Beach for a week. We loved spending time in the jungle and on the beach. 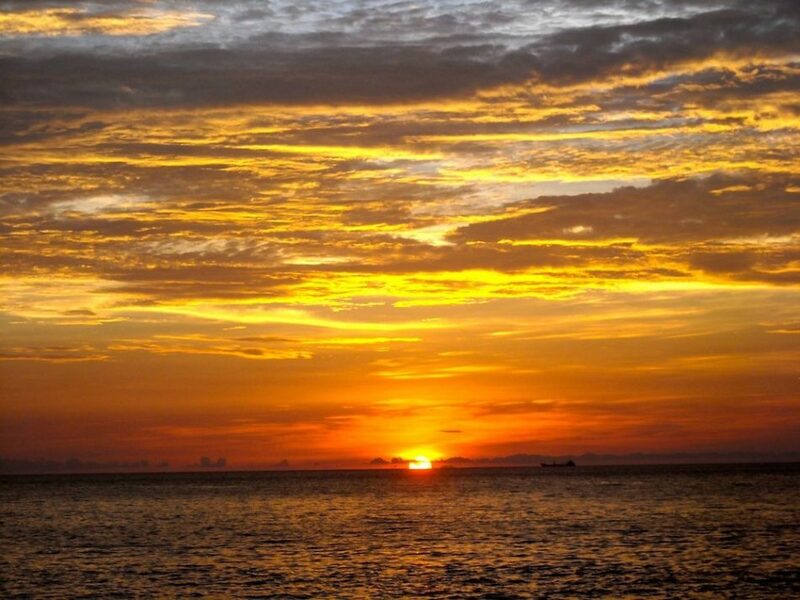 All sunsets were dazzling, different every evening. The only company we had in the jungle were cheeky monkeys, who some mornings didn’t let us leave our tent. We had to take sticks and make noise so that they would leave us alone. At weekends, the camp site gets completely full of local students. It’d be completely impossible to enumerate all the reasons to love George Town. We just wanted to tell you about the places in George Town we love the most. Add this astonishing town to your travel list if you haven’t been there yet! 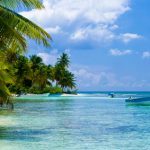 Very good article, Simply Nomadic Life. We enjoyed it a lot. Yep, you’re right on the mark regarding the ten reasons you mention for tourists and travelers to visit unique Georgetown in Penang, Malaysia – a UNESCO World Heritage Site. Something like you did upon arriving in Georgetown we did also with the intention of staying one month. We loved Penang’s culture and easy transportation to its airport to make trips to nearby nations and wound up staying almost 13-months in a beautiful re-modeled traditional Chinese Shop-house (Green House) behind the Police Headquarters on Popus Lane and a one street walking distance to Chowrasta wet-market. 11. There’s a free shuttle bus that makes a complete circle of beautiful Georgetown. We used to ride it almost daily from the bus stop very close to Popus Lane to get from point A to point B when the weather was too hot & humid to walk. Thanks for the article and pictures. #11 is a good addition Michael. Wow! I had no idea that it was such a diverse place. Having lived for a short time in Toronto, Canada, and having visited San Francisco & New York City, I’m familiar with the concept of diasporas cultivating their own communities within a larger area, but I would love to see this outside of a North American context. I imagine that there would be a noticeable difference given the influence of the surrounding area. Yes, Regis, George Town in Malaysia is definitely worth visiting. It’s so interesting to see these three cultures living in one town. We love this place and keep coming back once in a while. Please enjoy the food and the sunsets.